Spring Peeper Farm: It's Spring! It's Spring!!! Except for the mud and blackflies, I just love spring. It's a time of birth and renewal. Speaking of births, Charlotte gave birth to 11 little piglets yesterday. All by herself. See, they don't need our help. Dave left for work early that morning. (so what else is new) He told me that she was going to farrow that day sometime since she was very antsy. 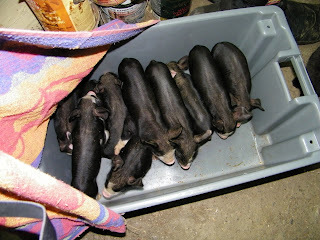 J. and I had some errands to do so we left for a few hours and when we got back, there was 11 little bundles of joy! They were all nursing contently. This morning though, it seems like there is one that won't make it. He must just have been weak I don't dare go see in the barn. Dave will take care of that. Anyway. If he has passed, I can't reach him anyhow and there is no possible way I am going in there with her. Uh uh. No way Jose! Not this chickie. If there is one thing I have learned in these last few seasons with the animals, is that pigs are extremely, excessively possessive mothers. Chickens, goats, cattle etc... do not hold a candle to pigs. Mind you it's different taking a little chick from a 3 lb mother, than taking a piglet from an almost 600 lb sow! Think about it, a pig is the only animal that we eat that given half a chance, would eat us back! The order came to 96$. Egad! So I cut back on a few things. It came to 80$. So I cut again. Everytime I cut something out, it's like cutting off one of my fingers. Sigh! Ok, well not really but I just want to grow everything!!! Needless to say I don't have the time, money and land to grow all I want to grow. It's just NOT FAIR!!! So then I cut again and the final total was 76$. It was a strange day all around. First Charlotte gave birth then I figured I'd let the goats out for a few hours, since most of the snow is gone so that means I can get to the gate. The girls trying to figure out what Dave is doing. First I have to say that Febe and Whisper have never escaped. I don't even have to put the fence on most of the time. Well guess what!? I can't do that with the famous new escape artist, formerly known as Esme! I put them in, stayed there for a while, then went in. As we were eating supper, I found that the "memmmm!!! "s were getting kinda loud. I looked on the front lawn and there were 3 goats. Not good. 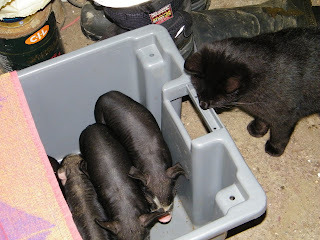 Esme showed the other 2 ones how the escape. Nice of her. But then Dave said, " Didn't you forget that the fence had let go on the other end of the pasture? That means that it's shorted out somewheres." So hubby and son fixed the fence and the goats stayed in. Fancy that! Amazing what can 7 strands of electric fence can do! I fired up the incubator last week. It's more than full. 53 eggs! I'm going for genetic diversification. Big words for a French Acadian woman! I really don't know if it's a real term. But it sounds good. Really I'm incubating some of my hen's eggs and 2 other friend's eggs. Well not their eggs, but their hen's eggs. Then I'll have created a genetically diversified flock! Doesn't it sound so professional and scientific. Well I started this blog 2 days ago and I'm still not done. Time just flies by. I just can't beleive how the hours pass by in a day. I need more time!!! Yesterday started like a nice day. By evening things went from very good to very, very bad. Let's just put it this way...I'm fine but my car is not. After I dropped J. off at drum lessons, I figured I'd go get his birthday gift at Walmart. Well I made a left turn on a green light and got smucked in the rear passenger door. The guy was flying, but because I didn't have a flashing green I'm in the wrong. They can't prove he was speeding. But when I looked to turn he was far enough away. So I had more than enough time to make it. Guess not. So I don't really want to talk about it anymore. Like Forrest Gump would say... That's all I have to say about that. 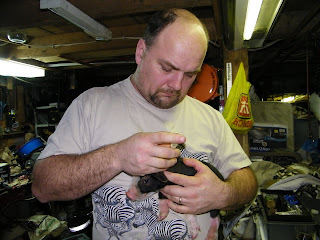 Tonight Dave and I gave the piglets their go over. Within 5 days of birth, they need their iron shots, wolf teeth cut and anti biotic shot. That's all we do to them. They don't like the dentistry but they don't even peep when you give them their shots. I also took this year's Christmas card photo while we had them away from mama. Tootsie trying to figure out what's going on. Dave doing the vet thing. Oh, on a sad note. That one piglet that I said looked like he wasn't going to make it ... didn't make it. Well that's about it for this time. Really it's enough. Those little piggies sure are cute, too bad about the little fella. Wow, your are a busy woman! The blog is interesting. I feel like my husband & I have jumped into the farm thing with both feet, too, and now are so busy with the regular day jobs and the farm, too. The piglets are so CUTE. Good luck with them! Post pics as they grow, please! Nice little piggies. How did your hubby manage to get them away from mama? We always cut their tails too and castrated the males. Wow can they squeal!! Good luck with the hatching. My folks did that and had success, until the temp gauge went on the fritz and they ended up having a batch with bad knees due to the temp fluctuating and have not done it since. We don't cut their tails and so far all our males have gone for breeders. There is no need to cut their tails if they have enough room to roam. They squealed when he cut their wolf teeth. The needles didn't bother them one bit. He had no problems with taking them away from mama. She was eating, but they were in their little corner. So as long as they don't squeal they're fine. And so is she. But if they squeal, watch out! oh my goodness look at all those little piglets!! and your right, never name a animal your going to eat, I can see where that would make it harder! I am a vegetarian of 20 something years, but my DH eats all meat :O)...so we won't name what he is going to eat!